You’re not hungry, you’re bored. OK, but I worked hard today. But I hurt, and I don’t care. But I’m tired, and not sleepy. Food will help. Who cares about my weight. I want to eat. You care. You’re unhealthy. 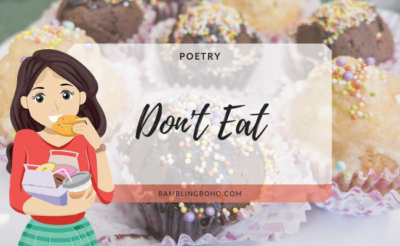 Don’t eat. Lame excuse. Have a carrot. I don’t wanna eat that bad.